It's fitting that Cancún is the setting, it's unnatural, plastic, over-priced, corrupt, garish and absolutely un-Mexican, for the latest climate debate-debacle. The Americans are spearheading the charge to commodify everything and thereby give their corporations even more private, for profit, access to the globe's common wealth. Not just the Yanks, many Euro folks, the Canucks, the Aussies, the Japanese, lately the Chinese...all the haves, can be heard in the background singing 'yup-yup-yup'. REDD is this iteration's [COP16] hottest acronym. REDD, or reduced emissions from deforestation and forest degradation, is one of the most controversial new issues in the climate change debate. The basic concept is simple: governments, companies or forest owners in the South should be rewarded for keeping their forests instead of cutting them down. The devil, as always, is in the details. REDD will destroy indigenous forest cultures. "Everyone who cares about our future, forests, Indigenous Peoples and human rights should reject REDD because it is irremediably flawed, cannot be fixed and because, despite efforts to develop safeguards for its implementation, REDD will always be potentially genocidal." - Tom Goldtooth, indigenous environmental leader and contributer to Red Cancun: A Daily Guide to the COP16 Summit from the Indigenous Environmental Network. Failure to recognise Indigenous Peoples’ rights in the UNFCCC. Failure to consult with Indigenous Peoples and local communities (for example in the FCPF). The UN definition of forests fails to differentiate between plantations and forests, meaning that companies could replace forests with monoculture tree plantations and still qualify for subsidies under REDD. “Technical” issues: Baselines, measurements, additionally, leakage, permanence. There is a serious risk of increasing corruption: in the South, where large sums of money could pour into some of the most corrupt regimes on the planet as well as in the North, where a new sub-prime market in forest carbon could be created. There is a risk of increased deforestation in the build-up to Copenhagen. For example, earlier this year, Indonesia allowed pulp companies to log native forests and allowed oil palm plantations to be established in peat swamps. Guyana is threatening that it could increase the rate of deforestation unless it is compensated for not doing so through REDD. Trading carbon stored in forests would create an enormous loophole allowing greenhouse gas emissions to continue. There is also a high likelihood that allowing forest carbon to be traded would lead to a crash in the price of carbon. Trading forest carbon would also fail to address climate change – we need to find ways to stop burning fossil fuels, not create massive new loopholes to allow the pollution to continue. REDD is an idea dreamt up by economists. Accountants and economists count the board feet of timber but miss the greater forest. The forest is a living community, its life can be extinguished or cherished but never bought and sold. Banks are corporations, corporations serve only their shareholders short term investment interests, therefore banks serve only shareholders' interests. The banks have their tentacles in almost every cranny, mortgages-lines of credit-credit cards-car loans-etc. 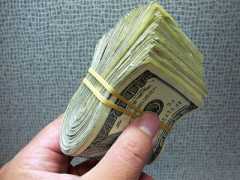 The bank's already rich shareholders get slightly richer with every banking transaction. There's a huge sucking sound, it's the rich vacuuming your wallet, it's gotta stop. How? Use Cash. Freeze out the bankers share. Learn about 'The Toilet Bowl Theory of Economics", learn the power of wanting less, learn to live independently in an interdependent framework, exercise your free will. Every independent action, freely chosen, further awakens the actor. At some point enough independent actions and unexpected acts of resistance would be called an insurrection. The success of this insurrection wouldn't depend on the size of the crowd nor extent of the media coverage, but on its usefulness, through a million tiny awakenings, in bringing corporate capitalism to a grinding halt. Shamanism is the spiritual practices of ancient civilizations and cultures. Shamanism is the oldest healing tradition in the world. Shamans were powerful men, sometimes women, who served as intermediaries between the natural and supernatural world. Shamans are held in the highest regard due to their authority in matters of death, of healing and of the spirit realms. 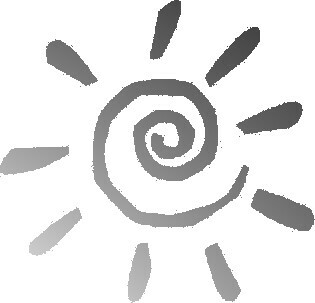 The brandishing that authority is the real Shaman's Art. Belief is a powerful healer, modern medicine calls it the placebo effect which is often belittled by big pharma and their drug distribution network. But 'before big pharma', BBF, started selling us its wonder snake oil our ancestors swore by their earlier versions. My grandparents knew plenty of miraculous recoveries caused by elixirs [and i'd add the revivalist spirit of the seller]. Science is convinced, emotions are hugely involved in immune response in every culture, geography and climate. Bobby McFarrin's advice, "Don't Worry, Be Happy" gets a thumbs up from the peer-review community. People are often most healthy when they are happy and vice-versa. Healthy people are internally independent, they exercise their free will with empathy for all, within a framework of the possible. Free will, freedom to chose, freedom to change makes happy people and-as we learned a few days back- Happy people would often choose to eat happy buffalo, who ate happy grass, that lived in happy soil, that helped clean the air, who helped clean the lungs and the thoughts of the previously unhappy people. Blackberries, Salmonberries, Huckleberries, and Thimbleberries - that we didn’t do anything to help grow, we just grazed and enjoyed the bounty and nourishment. In many cases i've seen personally how a stroll through the Shaman's garden, a few questions and answers, a bit of belief engendered, can lead to people taking control of their own health. Growing and tending a few herbs, picking some 'wild' berries are independent acts initiated by free will. Interdependent we are, our biology determines the parameters of our action, but not its direction-not its intent. Each of our destinies is unique because we have free will. The extent to which each individual gets to exercise their free will the greater their sense of independence and freedom. 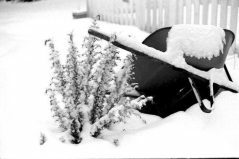 Clear a small area this winter, add compost and worms as soon as possible in your climate, start a few magic herbs, learn their stories, share their stories and the herbs with friends. Watch as cousins beam with inner power and vitality upon learning the stories and the herbs...Become the Shaman. Edmonton's downtown is unseasonably green these last few days, today, with just one day before the big game, the party will be bigger than ever. The Saskatchewan Roughriders have become Canada's Team in that they are every one's second choice [after their local favorite]. They have the smallest population base and the greatest fans. 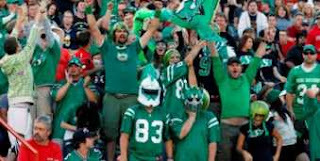 After last year's embarrassing loss to Montreal, Roughrider fans are looking extra green this year [perhaps from holding their breath until the last whistle]. There are some Montreal fans among the crowds, they kinda stand out in the sea of green surrounding them. Montreal is probably the bookies favorite by a couple points, but here in BC, and the rest of the west, it's Roughrider Nation at least 'til Monday. Keep your beer cold and your chips dry it could be a barn burner. Out west here fans will tell ya that the he Roughriders big-play potential on offence will be the difference. Al's fans snicker and ask if Saskatchewan's found anyone who can count to 13 yet. Canada has a few moments every year where this vast country, coast to coast to coast, 51/2 time zones, come together, tomorrow is one of them. 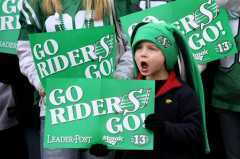 Canada's culture rides on the shoulders of its sports heroes, none broader than the Roughriders. i'm bettin Saskatchewan will finish its centennial season with a Grey Cup championship. Whirl-Mart is a 'mall theater' event where a group of supposed shoppers slowly push empty shopping carts silently through store aisles. Participants will not buy anything and form a lengthy chain of non-shoppers, continually weaving and "whirling" through a maze of store aisles.Whirl-Marters seek to mimic and mock what they perceive as the absurdity of the shopping process. The Zombie Walk is big too. In this ritual the cheerful dead wander around malls marveling at the blank, comatose expressions on shoppers' faces. 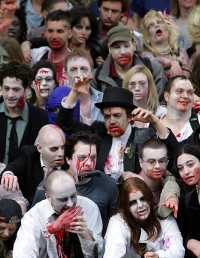 The zombies are happy to be among their own kind, but slightly contemptuous of those who have not yet begun to rot. There are over 500 organized theatre performances registered at Adbusters. Check it out, there are meetups and small theatre actions you could join and support. Why no give it a Whirl? It's Black Friday and millions of my fellow humans are storming the malls [evolution eh?]. It's also Buy Nothing Day and we're well into The Carnivalesque Rebellion where Adbusters' culture jammers of all kinds – from artists to churchgoers, anarchists to carpenters – will disregard the illegitimate laws of consumer society [hopefully]. The Carnivalesque Rebellion is, above all else, a chance to rise above cynicism, skepticism, and ironic detachment. It is an invitation to don the prankster’s mask, to regain the sense of magical possibility, and to finally start living. 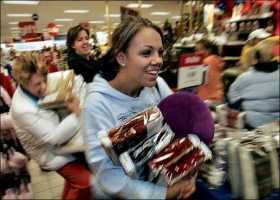 Canuckistan saves it's grossest consumption for Boxing day, interestingly malls on both sides of the border now promote both Boxing Day and Black Friday sales. Ain't it grand? On the other hand a Google Search of Buy Nothing Day in the news shows thousands of people in hundreds of communities are out whirling through the isles, that zombies are wandering among the dazed shoppers happy to be among their own kind, both groups are urging us all to simply want less. Sacrificing civility to the Dollar Almighty - Today plenty of Americans will fall in with their comrades and try to massacre their Christmas lists. On the other hand, they might simply surrender. After all, Black Friday also happens to be Buy Nothing Day. That first Thanksgiving was a high water mark in Euro-American relations with their indigenous cousins. 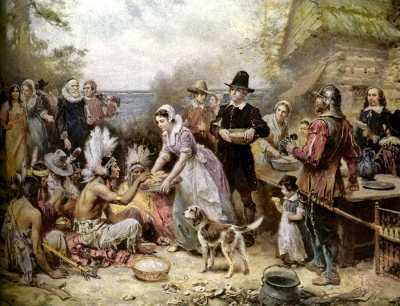 There really were a number of first Thanksgivings but they all shared one feature, starving European colonists being fed by empathic natives. The native inhabitants were animists, they believed that plants and animals had spirits which were angered by the harvest. To appease these spirits, tribes would make offerings which often included elaborate festivals. These ceremonies provided the foundation for today’s Thanksgiving Day holiday. Early on i learned that football, dinner and a nap were followed by endless turkey sandwiches and days of turkey soup. Even back then i had lots to be thankful for. Thanksgiving, back in the day, wasn't a prelude to shopping, it was a day of football shaped turkeys and those damn brussel sprouts. The coyotes come rolling through around 4AM lately, Pancho hears 'em-smells 'em-barks at 'em, and our day begins. The possibility of freezing focuses the mind. It's beautiful, crystal clear arctic air, crunchy ground underfoot-the mud having retreated into hibernation-a million-million stars. we see 'em early. It was -10C yesterday morning and it is again today. Unusual that winter would arrive so quickly and so early to the hideout. Even the insurrection slows down at these temperatures. i love the first few days of snow and cold each year, always have. It's invigorating to breathe the cold air. It bring back memories of cold air breathed during New England winters when i was a kid sledding down its hills. One of the best parts of growing up back in Adams, Mass was that every winter night a kid could go to sleep secure in the knowledge that school the next morning was far from a sure thing. No matter how unprepared we were for a test, or how undone an assignment was, we slept easy, the snow was our ally. Most days i sit and read on the web while drinking 1 huge cup of coffee. Today i've been reading about Eric Cantona's most excellent idea- A World-Wide Bank Run on December 7th -organizers are calling for the use of a new weapon, one available to any of us with a bank account. It is the simple act of removing all of our money from the banks, and doing so in mass on the same day - December 7th. Bringing Cantona's protest here to North America could mark the beginning of a new direct action movement , who takes actions outside of the normal process. In preparation for Dec. 7th, open an account at a credit union, then you'll have somewhere to put your money when the protest ends. If you are worried about the security of your funds on the day of the protest, withdraw all but a token sum beforehand and then close your account on December 7th. Consuming Less Is The Road Out Of Banker-ville. Folks in Ireland woke this morning bankrupt. Seems their banks lent huge sums to real estate and mortgage schemes, bubble bursting sums that must now be paid back, not by the few who pissed away the dough on their self-serving speculative schemes, but by the many who neither speculated nor profited. Austerity programs continue to sprout, the many protest-the few laugh, they all know who owns who. Ireland's a democracy eh, so's Greece, Portugal, Spain, France and the UK. All of 'em, and lots more, are in trouble for going all in to save their billionaire bankers from their own stupidity and short-sighted greed. Democracy is meaningless, people will believe any story, no matter how ridiculous, if it ends with them getting to have the stuff they want ...as Josh Holland of AlterNet says, "If you could create a political party that convinced a large number of people that by electing you they could eat all the ice-cream they want, and then sit on their butts watching TV all day and never put on an ounce, you’d have a pretty good chance at gaining power." The US is in especially deep, no nationality has consumed their way into crushing debt more efficiently than my fellow Amerikans. 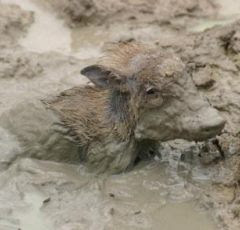 Yesterday The Mud Report ended with a call to 'bring corporate capitalism to a grinding halt'. Today it's one road to 'how': Stopping conspicuous consumption, genuinely wanting and being happy with less, growing and making our own, these are the ideas and actions that will hobble the runaway corporate agenda. Timothy Leary's advice to "Turn on, Tune in, Drop out" still works. Independent action, freely chosen, awakens the actor. Yesterday a friend said that many ideas in 'Let The Buffalo Roam' were quite like those in Richard Manning's 'Grassland' written in 1997. i don't think i ever read any of it but...who knows. His newest release 'Rewilding the West' sounds great, Richard Manning begins: "The most destructive force in the American West is its commanding views, because they foster the illusion that we command". 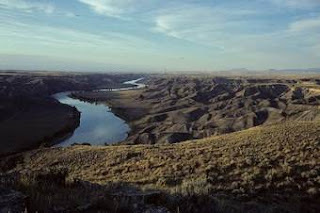 As he tells the story of this once rich, now mostly empty landscape, Manning also describes a grand vision for ecological restoration, currently being set in motion, that would establish a prairie preserve larger than Yellowstone National Park, flush with wild bison, elk, bears, and wolves. Manning proposes that we now find the wisdom to let the prairies remake us. Please read Manning's new book, i will. Another interesting email centered on building bridges and overpasses. He suggested we could re-use the miles of abandoned steel track left behind on spur lines. He suggested thousands of people could be employed as reverse John Henry's, who become a new steel lifting man. Further, the millions of treated wooden ties liberated in the process could morph into forming material. More honest work, love it. My answer centered on the aggregate, binding agent and the CO2 sequestration that might be achieved is by embracing new cement technology which features the blending pozzolans with Portland cement and adding mineraliser additives to reduce process temperatures. The potential rates of carbon sequestration due to improved range land management practices have been shown to rise from 50 to 150 (kilograms carbon per hectare per year). We're talking about millions of hectares, billions of tons of CO2 passively sequestered by encouraging the grasslands by letting the buffalo roam. Millions of jobs building fencing, fences, overpasses and old track removal. Millions of jobs, rebuilding something big. Hands on work, for to long people have lost jobs to inappropriate technology. Bigger wages often meant no job security, robots and accountants ruled, their jobs went offshore, their hearts went too. Now to many people are outta work, down on their luck, foreclosed on and pissed off. FDR built with a similar excess of labor, he taxed the rich and redistributed a small portion of the American pie. Maybe that's impossible now that the corporations own everything, maybe not. Corporate control is so depressing that people who call themselves anything politically—liberal, conservative, progressive, libertarian, independents, tea partyers or anarchists—should be acting together against the corporate criminals. Independent action, freely chosen, awakens the actor. At some point enough independent actions and unexpected acts of resistance would be called an insurrection. The success of this insurrection wouldn't depend on the size of the crowd nor extent of the media coverage, but on its usefulness, through a million tiny awakenings, in bringing corporate capitalism to a grinding halt. Buffalo and grasslands, predator and prey, co-dependent, co-evolved, interdependent and independent at the same time. 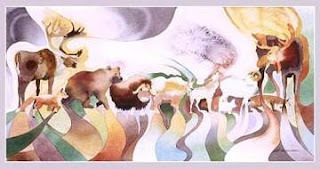 The buffalo and grasslands exist only as part of the 'big picture', the framework we hang our metaphors on. 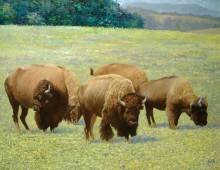 Grasslands and buffalo must have a back story as a frame, to give their song a rhythm. Same for everything, without a frame of reference, events have little meaning. An individual's frame of reference is constructed from his/her-story, each frame, like its owners experience, is unique and independent. After we reach some conclusion based on our frame of reference, we can exercise our free will in acting, or not, on those conclusions. Princes and paupers depend on the common weal for their dinner, one on his estate, one in his council house, each equally dependent on stability if nothing else. Princes need paupers just as much as the other way around. We all have hard times in our lives, we all need help getting outta the ditch once in a while. Helping our cousin, and we're all cousins, is empathy in action. The trick is to reach a conclusion where everyone parts as equals holding their head high. Sweat equity can work, everyone gains together. 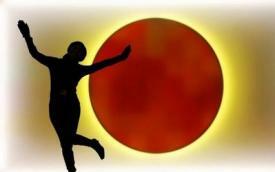 Dependence begets depression which begets poor immune response, inflammation and bad juju. Dependence takes a toll on princes and paupers. Princes can ever know if they are worthy or just born lucky, princes can only know the agony of defeat, that's why so many of them come to foul ends. In these times of worsening unemployment, rampant foreclosures, tent cities and fear we need "leadership from the bottom" as Wendell Berry says. Jobs based on hard work, on an honest days work for an honest days pay. We need big solutions to big problems. Letting the buffalo roam is a big [at least wide] solution to the wicked problem of emotional and fiscal dependence. Healthy, successful people are independent. Independent folks exercise their free will with empathy for all, within a framework of the possible. Free will, freedom to chose, freedom to change makes happy people and...Happy people would often choose to eat happy buffalo, who ate happy grass, that lived in happy soil, that helped clean the air, who helped clean the lungs and the thoughts of the previously unhappy people. Change is good, free will is better still. Interdependent we are, our biology determines the parameters of our action, but not its direction-not its intent. Freud said, "Anatomy is destiny." But Freud got lottsa stuff wrong, this too. Anatomy is the doer of deeds and the rules of the game, but not the chooser of which and why. Each of our destinies is unique because we have free will. The extent to which each individual gets to exercise their free will the greater their sense of independence and freedom. We are all connected by our anatomy, by our breath, by natural history, by our skin that connects us with the rest of creation. Our actions are mediated by our emotions and worldview as well as anatomic realities. Emotions, and the sieve of assumptions we see the world through, determine our actions and therefore our destiny. Everybody can remember the energy and joy during a big positive emotional moment, and its opposite. 'The thrill of victory and the agony of defeat', without free will there's neither. We are all biologically dependent, but where the independence of spirit feeds the psychology of freedom, the spirit dependency does not so much. 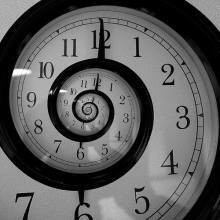 Dependency is a wicked problem, like independence, it feeds itself, is circular and it's a free choice. People, all people, need jobs, fair wage jobs that provide food and shelter for their families, jobs feed independence of spirit, freedom and the emotional state most conducive to all healing. If letting the buffalo roam isn't your top priority yet maybe exercising your free will muscle might be. The flame of free will is extinguished by the depression of dependence be it individually or across the wider culture. It's fairly easy to equate the health and happiness of ourselves with the health of our food and its food in turn. Happiness, emotive content, is becoming a little less-fuzzy of a problem in that we can trace stress hormones from our food through into our bio-chemical soup. Happy people would often choose to eat happy buffalo, who eat happy grass, that is growing in happy soil, which helps clean the air, which helps to clean the lungs and the thoughts of the previously unhappy people. 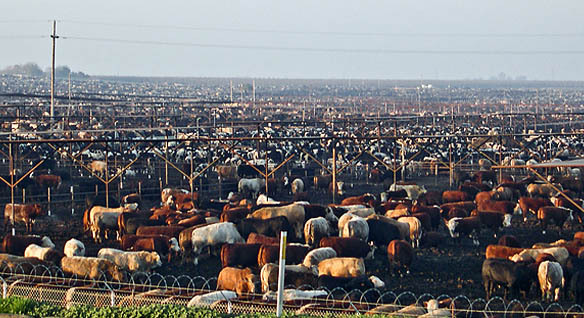 Cattle have been forced into short dependent lives by the importance of quantity of bankers' quarterly profits not by the quality of any, cattle or consumers, of our lives. Our individual quality of life, as well as our bank accounts, are not served by the agribusiness worldview. 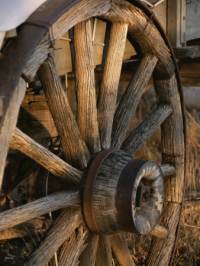 Independence of spirit lies at the hub of wheel of hapiness. Happiness is not a local phenomena, happiness is a contagious emotion, it's circular nature lies beyond the reductionism of science . "John Cassian spoke of work as an anchor which can stabilize the boat of our heart on the tumultuous waves of our thoughts." Much of what is now chaparral and desert in the Great American West was grassland when the buffalo roamed. It still could be if they did again. 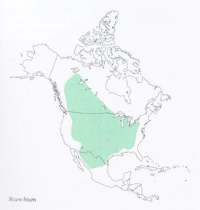 The Buffalo's [bison really] natural range included the plains of central North America from Mexico north into Canada and east as far as New York, Maryland, and Florida. BWG [before white guys]. They were the most abundant herd animal in history. 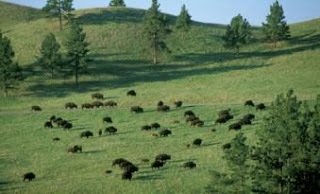 Because the buffalo traveled from basin to basin as they grazed, the grass co-evolved with them, the buffalo ate then spread and manured the grass seed, the buffalo and the grasslands spread each other. 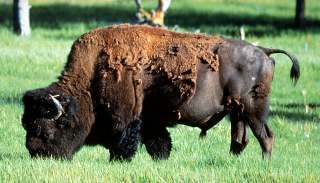 Sadly today, buffalo live only in zoological parks and in a few herds on refuges and preserves. Much of their former range is unsuitable for cattle, the grasses, in many of these marginal areas, have been replaced by sage brush. It ain't called the sagebrush nation for nothing. A shame really that we don't let the buffalo roam, let them slowly re-establish the grasslands in the high open deserts of the west. Range land can become a significant sink or sequestration pool for greenhouse gasses, literally sucking excess greenhouse gases out of the atmosphere and sequestering them safely in the soil, where they belong. We could passively capture and sequester, through organic soil and land management, at least 100 billions tons of excess carbon. It's been shown that humans would be better off eating buffalo than cattle, anyway. And so much grain output now goes to feeding cattle that the soaring world price of grain is starving the poor. i've got nothing against cattle, cattle are great at grazing too and they've been turning grass and grain it into edible protein for a long time now. 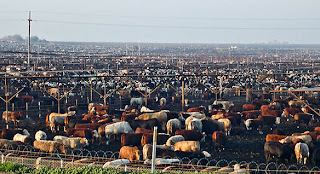 But the disgusting feed lot stuff has robbed the cowboy of his magic, for a buncha reasons, cattle eating ain't what it used to be. Everyone could be involved, we could be hiring unemployed America to build buffalo proof fencing, FDR style. Next, why not build highway and train track over passes to let the buffalo roam freely between the high basins. The over passes could be accomplished by excavating half of the necessary depth [buffalo ain't THAT tall] and building arches over the top half outta the overburden removed from the bottom half. The overburden could be mixed with volcanic ash, as the Romans did-they called it pozzalona-it's the original cement, its free, it's abundant, it's labor intensive. Imagine how many decent jobs could be created building fences and arched overpasses-some body's gotta manufacture all the gear, some body's gotta truck it too. Hard work creates hard workers, instills pride and skill in those workers. Sweat fosters independence, a well earned pay check is what Americans need. Bank bailouts and stimulus funds give the rich an extra bucks with which they might choose to hire a new maid or a couple gardeners, but letting the buffalo roam could put a few of those billions into the hands of people who'd spend almost every dime of their paychecks locally, hiring other local people in their turn. We could meet or exceed our carbon targets and put people back to work, but also important, we'd see pride and independence of spirit growing, along with the grasslands, if we let the buffalo roam. The Ice Cream Truck and The American Dream are Outta Gas. Real unemployment, not just the number folks still collecting benefits, hovers around 20% according to Joesph Stiglitz, a past winner of the Nobel Prize for Economics. The Fed is furiously printing money in a last ditch attempt to save us from deflation [see video below]. Obama has spent the last two weeks attempting to get the rest of the industrialised world to not cut the value of their currencies while at home the US is doing everything it can to cut the value of the greenback. Currency wars, austerity programs and trade wars are, as Pierre Trudeau said, "unfolding exactly as they should". The American Dream, based on the myth endless growth, is over. In the short run it'll be replaced by upheaval and dislocation. In the long run, though, it could be our only real hope for our children and grand children's future. Endless growth in a limited resource environment is impossible. But it sure sounds good. As Josh Holland of AlterNet says,- "If you could create a political party that convinced a large number of people that by electing you they could eat all the ice-cream they want, and then sit on their butts watching TV all day and never put on an ounce, you’d have a pretty good chance at gaining power." The Twilight Zone, Or Our Economy Explained - If you have a sense of humor about the economic apocalypse, check out the video below. It is a most cogent, hilarious, depressing analysis of Ben Bernanke, Goldman Sachs, blowing up the global economy, quantitative easing - a.k.a. printing money - and why we are all screwed...bearing in mind that if you can laugh at yourself, and you can laugh at the apocalypse, then you’ll never run out of material. The Chinese Professor video [below] was developed by a conservative American economic think tank not as a Republican ad during the recent mid-term elections as i originally assumed. At first i only saw snippets of it on the news, then the other day i went to YouTube and watched it completely a few times. It is an excellent example of how powerful the use of archetypal symbols can be. It's well made, it's very effective and its underlying message reminds me of a few pertinent lessons from Sun Tzu's 'Art of War'-written in the 6th century BC. Sun Tzu's treatise, and the commentaries on it, are taught in every military academy in the world. It's also studied in every business school, most philosophy departments and many others in almost every language on earth. Why? Because the Art of War isn't just about military issues, Sun Tzu's logic is easily adapted to all of our lives everyday. Sun Tzu says, "To fight and conquer in all your battles is not supreme excellence; supreme excellence consists in breaking the enemy's resistance without fighting." Sounds like the message in The Chinese Professor to me. Sun Tzu's first rule of war is to own the ground [as we don't in Afghanistan]. Hence Sun Tzu said, "Whoever is first in the field and awaits the coming of the enemy, will be fresh for the fight; whoever is second in the field and has to hasten to battle and will arrive exhausted." Sun Tzu's Art of War says, "All warfare is based on deception. Hence, when able to attack, we must seem unable; when using our forces, we must seem inactive; when we are near, we must make the enemy believe we are far away; when far away, we must make him believe we are near. Military tactics are like unto water; for water in its natural course runs away from high places and hastens downwards. So in war, the way is to avoid what is strong and to strike at what is weak. Sun Tzu says that the second rule of war is to know your enemy. This is the deeper lesson of The Chinese Professor video. Know your advisory as well as you know yourself. Know your advisary's arguments, his knowledge, his strenghts, his weaknesses in all things. Belittling one's adversary, using invective as a replacement for insight, using simple slogans to avoid complicated counter arguments do nothing to widen any one's path-instead these self-imposed blinders are leading us into the jaws of the dragon. The National Deficit Commission proposals are totally one-sided and guess which side they favor? Like almost all politically chosen commissions, this one was made up of people who found exactly what the were looking for. The members of the National Deficit Commission contained no one who disagreed with its preordained conclusions. No one like Stiglitz or Krugman, two highly acclaimed economists, were chosen. An except from the article linked below-an excellent and important article- that i hope every one of us reads: "The Commission’s proposal is the most naked, undisguised declaration of class warfare possible. Its agenda is not to reduce the deficit but rather to reduce what is left of the American middle class and American workers, to a condition of servitude, of feudal peonage. Their poverty will make them docile and subservient. This will make possible the final looting of America by those whose sociopathic greed has brought it so low already." - Robert Freeman. The US economy is in deep doo-doo, massive debt in both the public and private sectors is the result of decades of voo-doo economics. Most Americans are convinced they are entitled to not live within their means. The debts they individually and collectively have run up amount to nothing more than mortgaging their children and grand children's future. Instead of honest discussion about their situation the politicians of all ilks lie to 'we the people' and print more money. They come up with endless happy-talk schemes designed to mollify any opposition while in reality their schemes always shovel more money from the many into the already bloated pockets of the few. 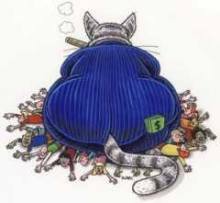 The rich have moved the good paying jobs out of America to make themselves richer on the backs of the poor. Not just the poor of far off lands, but all of the poor, including everyone who isn't them. Every corporation serves the same master-shareholders. No matter what chocolate covered pap they say, underneath the chocolate are the tools of your oppression. The corporate criminals use every trick they can dream up to divide the worldwide working class. So far, it's worked. But the rise of populist anger here in N. America and in Europe, hopefully, portends the end of the robber baron era. Don't listen to their lies, reject the false divisions for the divide and conquer tactics they are. So far in America this populist anger has come mostly from conservatives, now is the time for rest of the political spectrum to stand up on their hind legs and join in the fight. The President’s National Deficit Commission has effectively declared that the rich will now go after what is left of working and middle class wealth and will take whatever steps are necessary to seize it. If allowed to succeed, their plan will reduce Americans to a state of serfdom. The wolf makes its living by way of the hunt. The wolf doesn't hide and wait for his prey like a snake, he/she actively searches for their dinner. Sometimes solitary but most often in cooperative groups, the wolf seeks its prey, the prey seeks to avoid the wolf. 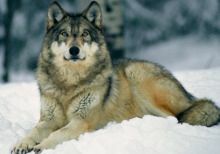 The wolf, like most of its prey, is warm blooded so both are driven to action by their relentless metabolic demands. The prey, be they mice, deer or buffalo, gathers its dinner from the more sparse floral protein in its domain. The predator gathers its dinner from the more concentrated protein of its prey. Among the many ways of seeing and being, we in the western world often choose to use categories as our way of seeing. Our categories, though, are but arbitrary divisions of a continuous whole, they have evolved in our western culture because they are a useful tool in the triage of incoming information that might otherwise overwhelm us. Categories allow us to make quick judgements and to act on them. Categories, and other mental shortcuts, have been such a successful strategy that we westerners now do it unconsciously, but all shortcuts have shortcomings. One shortcoming of using categories, like predator and prey, is that we overlook the fact that these mental shortcuts are tools not truths. The real world shows us that predator and prey are one. That their populations and the abundance of the their domain rises and falls in an intertwined dance. That the health of the prey depends on the health of the predator as much as on the abundance of the flora it gathers. The prey grow stronger and more efficient over time by the actions of its predator, the predator and the flora also evolve over time as each becomes a better dancer. Thoughts and ideas too gain strenght and efficiency over time not by the action of the herd, but by the challenge of the skeptic, the outlier, the predator. The weak and the old, be they ideas or buffalo, fall first to the skeptic or the wolf. Like mice or moose, we men and our ideas only grow stronger from the actions of our predator cousins. We, mice and men, predators and prey, are all in this one life together. We Might As Well Dance Eh! Last night's news here in BC featured a piece on the huge, 3 hour long lineups, at the Peace Arch border crossing between BC and Washington State. i tried to imagine why these thousands of my fellow canucks would be willing to spend one of their few days off work sitting for hours in a such a huge lineup only to undoubtedly spend another buncha hours in another huge lineup at the Canadian border when they return home later in the day. That's when it came to me: biological devolution was the answer. Buyology is defined as-noun: The urge to consume, purchase, buy, own. "He's so into buyology -- look at all those labels." So many folks are driven by the constant advertising bombardment that cunningly tries to convince us all that we'll be more popular, more attractive, more wealthy, more-more-more everything if we'd just smarten up and buy whatever it is they're selling. The advertising industry does its homework, they've read up on human psychology, they've learned that almost everyone of us rogue primates is, deep down, insecure and fearful about our looks, the opinions of others, our future security, lottsa stuff. Salesmen and advertisers use this knowledge about our fears in an attempt to manipulate us into irrational behavior like lining up for hours at a border crossing to save a few miserable bucks on a buncha crap we don't need anyway. These folks in the lineups weren't poor people going to Bellingham to buy cheese, milk and bread, at the lower American prices, so they could feed their family next week. These folks were, almost all, idling their precious time away in an SUV or expensive new-ish car, they were addicted consumers. Consumers are unconsciously destroying the planet. The addiction to consumption is devolution in that every one's genetic endowment to their children and grandchildren, the basic biological urge, is being rendered meaningless by needless-senseless buyology. Wake Up People, do you really want to be a puppet, a tool in someone else's game. i'm a pacifist but that in no way effects my admiration for all the brave men and women who have given their physical health, their mental health and their lives in service of the ideals they believe in. In some ways pacifists understand quite well how hard it can be to stand up for what you believe in. My parents both served in the Pacific during WWII. My mom was a nurse in a Mobile Army Surgical Hospital, a MASH unit. My dad was with the US Army Corps of Engineers. They met at the hospital where she was stationed and he was recovering from massive multiple wounds. They were there in the same hospital in Busan Korea for the last year of the war. i guess he fell in love with his nurse. Neither of them were ever the same after the war their families told me years later when i was old enough to understand. My dad was the worst, he suffered every minute of his remaining life from what's now known as Post Traumatic Stress Disorder [PTSD]. Back then they called it being shell shocked if anything. He drank himself into unconsciousness almost everyday for the rest of his life, only missing those few days he was to broke to buy a bottle. My mom and him split up when i was under 2, she carried the ball by herself all her life in large part because my dad was so screwed up he couldn't function, was sometimes violent, abusive to her and, of course, always drunk. i grew up always missing what i didn't know, always wondering, always hoping he'd show up. He never did, many many years later i forgave him. But it had a huge effect on me, undoubtedly it still does somewhere deep inside where it hides. 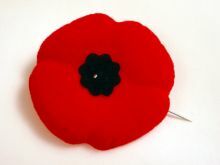 Do i remember on Remembrance Day? Of course i do, how could i ever forget. With any luck my daughters will have escaped the multi-generational disaster that WWII brought to my family and millions of others. War is hell. The brave young men and women who volunteer to stand at the gates of that hell deserve our solemn praise. Maybe that's why i'm a pacifist, because i can't forget. 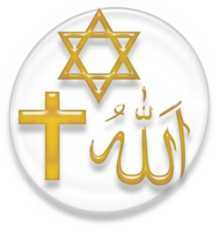 Each of the 3 largest Abrahamic Religions, Judaism, Christianity and Islam, have many millions of followers worldwide, millions of good people doing their best to live their lives in peace and harmony with everyone else. They each have slightly different doctrines that their millions of believers gain comfort from. But each also has a group of fundamentalists within their ranks who believe that they are the only ones who hear the 'real' voice of god and that that voice is telling them 'the' truth. Christians have their Deconstructionists, Islam has its Wahhabists and Judaism has it's Zionists. Each has very different teachings but they share their intolerance of any opposing opinions, they share their use of dogmatism, instead of debate, as a tool of power and control. Dogmatism is defined as “unfounded positiveness in matters of opinion,” and the “arrogant assertion of opinions as truths”. Religious fundamentalists are by far the worst political danger the world faces. There's no difference which 'book' they believe contains their god's own words, it's the unchallengeable, incontrovertible nature of their mindsets that creates the danger we now all face. PM Harper gave a speech two days ago where, within two sentences he pledged to defend Israel "at whatever cost" and pledged "a relentless stand against anti-semitism". Israell is a country, Judaism is a religion. Yet our attention is constantly being diverted by the semantic trick whereby we equate Zionism and Judaism when they are two totally different things, the media and political leaders have mis-educated the western world by using the terms interchangeably. Israel's Zionists and settlement movement members are in the minority but they control the government. Harper's understands the difference, but he uses the terms interchangeably to appeal to his born again Christian supporters. The Christian Deconstructionists back the Zionists because their 'book' says that that's the road to heaven, to their Rapture. Anti-Zionism isn't anti-Semitism but the dogma of the Deconstructionists wants us to believe it is in order to serve their selfish delusions. Wahhabists believe that Israel and its Zionists are the devil and the road to hell, as their 'sacred' book somehow tells them. So here we sit, hatred blossoms, wars rage, torturers torture, bombs kill innocent civilians, drones terrorize and kill innocent villagers. Why? Why does mankind face its greatest threat? Why are nuclear arsenal at the ready? Because fundamentalists of slightly different religious persuasion 'believe' that they, and only they, hear the true word of god whispering in their ear. But its the same voice every religious fanatic hears, it's the voice same Mohamed Atta heard, its their own inner voice telling them another self serving lie to justify another unspeakable act in the name of some imaginary ghost. Come on people Wake Up! November 9th is one of my two favorite calender days each year, the other being June 19th. Those are the dates when my two daughters were born. The older daughter was born in 1971 the younger in 1989. i wish i could feel safe about using their names, pictures and specifics about why i'm such a proud dad, but unfortunately we live in a weird world and their security far out weighs my want to do so. So...today my little girl turns 21, she is the best daughter a guy could ever have. She's nearly finished university and will end up with a combined BSc of Science and BSc of Nursing degree when finished. My big girl, and mother of my three grand kids, graduated university some years ago with a Bc of Science as a Bio-psychology major, then went on to earn her MS in Audiology. They both got where they are by hard work, they both have earned everything they've accomplished, they both freely make their own choices about the directions their lives take and it that in itself makes me very proud. Twenty one was a big deal way back in the stone age when i was a kid, in today's world-not so much. Both of us parents though feel an extra bit of pride today as we see this milestone as we did back when we passed it. It was for us a line in the sands of time between our childhood and our adult status. i remember feeling the same kinda feeling when my older daughter passed it too. 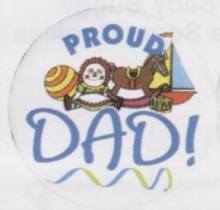 Regardless, we both love our little girl and are very proud of her. i've spent the last 40years, nearly all of my adult life, doing my best to be a good dad to my girls. For sure other folks have done things differently, made different choices along the road, and for sure some of my choices worked out well-some not so much. But, like everything i ever did, i did it my way. i'm proud of my girls for lottsa reasons, but none more than the fact that they are doing/living their lives well and according their own worldview, who could ask for more. 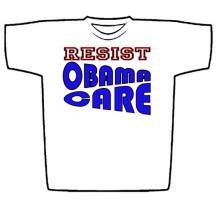 One of the main themes in the Tea Party's recent campaign was to resist Obamacare. Since election night i've heard various Republicans and Tea Partiers explain that they don't have pass legislation to stop it, all they have to do is to defund it by winning a majority vote in the House to do so. It's highly probable that, no matter how much support that kinda sentiment might have, the Rebublicans of all stripes will be bought off with defense contracts to their districts or some other combination of bribery and coercion. They are politicians and like most all politicians their first priority will be their own re-election. But maybe not, we'll see. After living these last 41 years up here in Canuckistan i've come to know and love the Canadian Healthcare System, its not perfect but it sure is a lot better than either the existing US model or Obamacare. Up here folks don't lose their homes or their life savings because they can't afford access to health professionals. Up here folks can get basic preventative care which often results in their small issues not evolving into huge ones. Under the present US model many folks get zero access to healthcare until things digress to emergency status and they are wheeled into an emergengy room where they are examined and treated for their now hugely expensive problems. Those huge costs, that earlier-with preventative care-mighta been avoidable, are paid for by the state. The state gets the funds to pay its bills from the taxpayer via taxes that are mostly paid by the more well off. The results are that the rich pay for the poor's healthcare-sounds like socialism to me eh-and they pay far more than they had to. Obama ran for office promising 'Change' in healthcare, and a lotta other stuff. He promised he'd never sign a bill that didn't contain a public option, he promised huge reform of the prescription drug laws that would allow Americans far easier access to generics, would allow groups to negotiate lower prices with Big Pharma and, if all that failed, would allow individual Americans the freedom to go abroad to have their prescriptions filled in places that did negotiate with the drug company goons. Of course, we now know that Obama was, at the same time he was giving speeches promising the opposite, himself negotiating with Big Pharma and the health insurance industry behind closed doors for huge dontions to his campaign-and who knows what else-in exchange for not doing what he was publicly promising. Just another politician-a liar-or both? So, in my opinion, defunding Obamacare is a big winner for everybody. It isn't healthcare reform, it isn't healthcare insurance reform, but is a massive transfer of money from 'we the people' to the insurance and pharmaceutical corporations. This issue can be another uniting cause around the circle of the political spectrum. By stopping this insanity called Obamacare in its tracks there'd be an oppurtunity to start again, to open a real debate, to perhaps come up with big solutions to these big problems. 'We The People' deserve better. Framing Torture - Criminal and Immoral or Expedient and Effective? This week former president G.W. Bush's memoir will be on book store shelves and glowingly reported in the compliant mainstream media. In it W. recounts his decision to approve torture so it seems like a good time to revisit the issue of torture both back then by the war criminals Bush-Cheney-Rumsfield and since then by the accessories after the fact, Obama and Holder. The Bushy's started the ball rolling by asking many members of the Justice Dept. to write opinions about the use of torture. They recieved about 30 different opinions from various lawyers who worked there. Of those, 2 supported [Bybee and Yoo] its use, the rest opposed it as criminal and/or immoral because the UN Convention Against Torture [ratified by Ronald Reagan in 1987] and because Title 18, Part I, Chapter 113C of the US Code both clearly make its use under any circumstances illegal. As we now know the Bushistas cherry picked the two by Bybee and Yoo because they fit the Bush regime's preconceived agenda. Water boarding isn't a new thing, its use has been documented in numerous cases for centuries. After WWII the US held war crimes trails, found Japanese officers guilty of torture for their use of water boarding and executed them. During the Viet Nam era the US put American soldiers on trail as torturers for using water boarding, they were found guilty and received stiff sentences. Those were the good old days when right and wrong, illegal and effective, immoral and expedient were understood as opposites. Now things are different, as times have changed, as the framing of the torture issue has been allowed to change, whatever is useful has become right. Team Bush tortured the 'terrorists' at Gitmo, at Abu Ghraib, in Bagram and who knows how many secret off shore CIA prisons. In my opinion, they undountedly created far more enemies for the US than they stopped. Along came newly elect team Obama fresh off his election campaign where he vowed to prosecute those responsible for torture on numerous occasions. Obama's framing of the issue during the campaign was one of morality and legality. But once he was elected he allowed the shithead Cheney to re-frame the question throughout the media to one of necessity and effetiveness. Obama, a well trained Harvard lawyer, must have understood immediately the repercussions of letting Cheney's expediency framing go unchallenged. He remained silent, that was his moment, on the torure issue, to draw a line in the sand between right and wrong and he chickened out. Neither Obama nor Holder has ever held the Bush administration or their lawyers accountable. Bush, Cheney and Rumsfield should be doing the perpwalk for their war crimes. Obama and Holder's decision makes them accessories after the fact to those war crimes. History will not judge any of them well. Nor will it look kindly on all who've remained silent. Carnival Capitialism - "Step right up, there's a winner every time." Why is the fed so obcessed with artifically supporting the stock market? In my opinion, it's because so many folks were hoodwinked into mutual funds as a tool back in the Reagan years. Back then the 'markets' had largely run outta new dough. The bankers came up with another ploy, this time it was to secure a steady flow of funds into the carnival by offering folks the time honored flim-flam of a free lunch. "Step right up, there's a winner everytime" the carnival barker shouts. 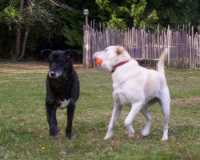 while the carny's owners know that, as P.T. 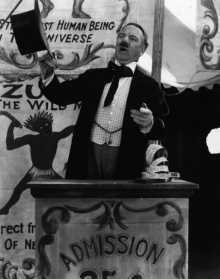 Barnum, one of the original actual carny owners said, "There's another sucker born every minute." The hated bank bailouts and assorted 'stimulus' packages were the western governmnts' attempt to forstall a worldwide stock market meltdown which would have resulted in the value mutual funds plummeting. So, to avoid the voter backlash that would have thrown out incumbents in democracies around the globe [thereby forcing the pigs away from the trough], the 'leaders' chose the largest single transfer of money in world history. They chose to bankrupt everyone's children and grandchildren by borrowing trillions from China and elsewhere and sending the dough to their favorite banks and corporations. The Tea Party Slogan "Stimulus, The Audacity of Dopes" captures accurately the spirit of populist sentiments on the topic. Now there's millions of little guys who were counting on their mutual funds as their retirement security, instead have seen them drop during the '08 warmup to the big drop that will happen when the debt crisis turns into massive austerity programs and 'consumers' will be forced to stop consuming most everything other than food. That'll be the popping of the last big bubble-the commodity bubble. Look out cause from what i've read the 'smart' money, the carny owners, are selling commodity stocks slowly to mutual fund managers and either hoarding the cash or turning to real assets like gold, or in China's case oil and potash. The big boys know the second [much larger] dip is coming soon to a carnival near you. Get ready for yet another round of quantitative easing (i.e. printing more money), one may well ask: Why? Emotions are running high in Saskatchewan following the $US40 billion bid for the Potash Corporation of Saskatchewan by BHP Billiton. Premier Brad Wall has invoked the image of Tommy Douglas as a symbol of prairie populism in his attempt to stop the Billiton deal saying, that if accepted, it could cost the treasury billions of dollars in lost royalties and taxes over a decade. PM Steven Harper's Conservatives, to their credit, have nixed the deal, at least for the next 30 days, saying it wasn't in Canada's longterm interests to allow it to proceed. Media outlets worldwide are running stories about how Harper's decision compromises Canada's pro- international investment paradigm, that it's based on politics and that he's knucked under to prairie populism. Certainly, to some degree, Wall's opposition to the hostile takeover bid is based on popular sentiment throughout Saskatchewan as well as his honest assessment that it threatens Saskatchewan and Canada's future security. Potash is a mineral salt high in potassium, mined for use in agricultural fertilizers. Saskatchewan has 90% of the world's reserve and if/when food scarcity becomes the huge problem it looks like it will potash will become gold. But, in my opinion, the big story is that the Saskatchewan-based Indigenous Potash Group now has found the door opened to their multibillion-dollar competing bid for Potash Corp. The First Nations group said it is collaborating with merchant banks, pension funds and Chinese investors to prepare their counter bid. The indigenous group has already raised $25 billion in the last two weeks from potential investors. "We cannot be left out. We are moving on this," said Rick Gamble, who is chief of the Beardy's and Okemasis First Nation and spokesman for the Indigenous Potash Group. "This is exciting stuff. We're ready to go". Assembly of First Nations Chief Shawn Atleo addressed that assembly yesterday, and spoke to the importance of the potash debate saying, "It will be a benchmark for the whole country". Here then is a great oppurtunity for our often alienated-overlooked indigenous brothers and sisters to regain some control over the land of their ancestors, to provide direction in the ongoing plunder of their [and Saskatchewan's] natural resources and to re-exhibit pride in their historic cultural heritage. Right On! The articles demanding a Democratic presidential primary in 2012 started to roll out yesterday less than 24hrs after the midterm polls closed. It won't be easy, the Democratic establishment has quietly been changing the rules to make it almost impossible for anyone to challenge the liar and thief Obama. Difficult, yes-entirely impossibe, no. In my opinion, progressives have no other option. Hillary is out of the question, she's been co-opted by Obama [hold your friends close, your enemies closer], she voted for the Irag War, her hubby Bubba would be a huge anchor for her to drag along behind her and, i think she's over her being robbed of the 2008 nomination. In my opinion, any Democrat willing to challenge the Obamanator would have to come from outside the traditional Democratic establishment. Any Sarah Palin type populist challenge from the grassroots of progressive America would likely have to be a Wendall Berry type-leadership from the bottom-outsider. His or her main spokespeople would have to be also. There's a new way to do organizing now and it's bottom up, not top down like the traditional model. Obama used it to successfully catch a ride on the populist wave. Now that the populist wave has left him flopping around in the undertow, it's time for a 'real' reprogressive to use these tactics to challenge the heartbeak kid. The new tactics use the new technologies of social networking and the blogosphere to bring together the ideas and energy of many minds to form a broadly based coalition of the young, the old, the poor and the dispossed. Any challenger would have to accept no corporate donations and limit any individual's donations to a small [maybe $100] amount. Any challenger would have to tear a idealist page out of the Tea Party planner, they'd have to state clearly that ideas are open debate and compromise, but that ideals are not. The clock is already ticking, the Iowa caucuses, with thier fairly open rules of engagement, are the first stepping stone to nominating and electing a 'real' progressive in 2012. Be there or be square. Quietly revising the 2012 Democratic nomination process. A good number of people - on both sides of the spectrum - are allowing themselves to speculate on the previously-unthinkable scenario that possibly, just possibly, the President might be successfully challenged in the primaries in 2012. Whadda bummer, Prop 19 lost yesterday in Kalifornia 53% to 47%, in my opinion the reason is more people voted against it, than for it. The coalition of kids, cops, liberarians and Cheech and Chong devotees wasn't strong enough to overcome the huge turnout against the measure in Northern Kalifornia, the region most turned on to pot growing, where many growers and the legions of people they employ in production and distribution feared it would negatively affect their livelihood. On the same token things have now changed pychoactively everywhere in the state. 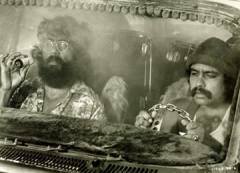 The genie's out of the bottle and reefer madness has gone mainstream. Pot users will be coming out of the closet and onto the beaches and streets. With nearly half the people, including most of the cops, supporting the initiative clearly the state has gone to pot. Its close loss could actually be better for us stoners than a narrow victory woulda been. Now big business will hafta stay outta the grow show business and government won't get to zig zagging their way into our wallets by adding their cut to our already expensive recreational pastime. The folks in the emerald triangle will still have to compete with the outlaws up in BC but at least its not Sprawl-Mart eh. Kalifornia wasn't the only state to vote anti-stoner. In South Dakota they shotgunned an initiative and we're still waiting for the smoke to clear on Arizona's decision. Then there's Oklahoma who voted yesterday to ban all types of stonings statewide. The big losers in all those states were the principal bankrollers of each of these initiatives: the makers of Tostitos, Twinkies and Peanut Butter Cups, also know as the TTP. But not to worry, curl up on the couch, roll up a fatty and relax 'cause this bud's for you. Oklahoma Bans Stonings - Oklahoma voters have approved a measure that would forbid judges from considering international law or Islamic law when deciding cases. It's mid-term election day in the US and the results will start rolling in a of couple hours. But before they do there's one issue that has dominated much of the discourse from all 'sides', the influence of big money. The Democrats want us all to focus on the big corporate money being donated by shadowy organizations to the Republicans. The Republicans favor focusing on how the Democrats are supported by similiar shadowy money from corporate interests, union interests, trial lawyers etc. The fact is all 'sides' make backroom deals with big money. Big money, of all types, doesn't give away their financial support they use it as a lever to gain big influence with all sides thereby creating the situation where the real winner in any election is gonna be them not the citizens, not 'we the people', not the many but the few. For sure the Republicans and their rabble rousing Tea Party faction have recieved more big money in this election cycle than the Democrats, especially from the banks, because the banks figure they'll get slightly less regulatory control from a Republican dominated congress which would allow them to continue or accelerate pillaging the assets, both natural and fiscal, of the world with abandon. Another fact, is the Democrats have, exactly like their predessors, shoveled trillions into the pockets of the already obscenely rich as payback for their backrooms deals. The Tea Party may well be full of populists but their buses [the Tea Party Express], their hotel rooms, meals, venue rentals etc. are paid for by big money. Same for the Democrats-same for the Republicans. Big money doesn't just hold sway in America, it's the same here in Canada, both the Conservatives and Liberals are on the big money dole the slight exception being the NDP who primarily gets its big donations from big labour instead. Same's true, to slightly vaying degrees, in all the EU countries, in Japan, in India, in...you name it, if it's called a democracy big money has bought big influence there. In China same thing, except in China or any totalitarian regime, big money doesn't have to bribe two or three political leaderships they only have to bribe one, much simplier eh. The rich have learned they don't need to have their puppets in democracies pass laws that might look unpopular with the population, they can have all the cake they want just by having them tweek the rules and regulations that determine how grandiose sounding laws are actually enforced. Big Money buys big influence everywhere. The only solutions for my fellow Americans are 100% taxpayer funded campaigns and term limits. Unfortunately, as Upton Sinclair said “It is difficult to get a man to understand something when his salary depends on his not understanding it.” Today's election won't change anything no matter how it turns out, come tomorrow the rich will still rule the rest will still drool. Skeptic, like creationist or socialist, is not a pejoritive term. Creationists call themselves creationists so it's merely the defination of a person who truely believes in creationism, same for socialists. Skeptics wear the term proudly. The word denier, on the other hand, is a denigrating term, it implies that there is an absolute truth and that the speaker-deliverer of the name denier knows and speaks that 'truth', whereas the person on the recieving end also knows it, but for self-serving reasons, refuses to acknowledge that he/she does. When a person uses the term denier to describe the mindset of an adversary it's the user of the term that's being closed minded, illogical and unscientific not the person being called the name. Skeptical? Hopefully we're all skeptical, hopefully we all 'ask every question and question every answer'. In reality there are no 'absolute truths' about anything, certainly nothing scientific. There are probabilities, some are very high, some not so much, but 'absolute truth' only exists in religion. In science everything is open to new information coming along that can change things. Science, good science, logically valid science is about Thesis + Anithesis = Synthesis. As soon as any logical arguement has been challenged by a new concept, that is itself valid, then a new synthesis is formed. This new and improved arguement is then itself instantly open to the next new challenge, and if it's a valid arguement, another new synthesis becomes the accepted idea ad infinitum. eh. This mental process is the defination of being a skeptic. We humans have used it to learn new ways to live in the world since we climbed out of the trees. If we hadn't we might still be up there. Skeptic or denier? Semantics matter, call me a skeptic and the doors of communication stay wide open, i'm proud to be a skeptic. Call me a denier and feel the wind of that door closing. The Skeptics Society is a scientific and educational organization of scholars, scientists, historians, magicians, professors and teachers, and anyone curious about controversial ideas, extraordinary claims, revolutionary ideas, and the promotion of science. Our mission is to serve as an educational tool for those seeking clarification and viewpoints on those controversial ideas and claims.